A festive month, July. It is the National Month of Baked Beans, Blueberries, Hot Dogs, Ice Cream and Picnics. Moreover, it embraces many an excellent National Day. Cow Appreciation Day, for example (I appreciate cow best when it’s plated), and official Days for Fried Chicken, Lasagna, French (and maybe even Freedom) Fries, Sugar Cookies, Cheesecake, Junk Food and—for take-out—Paper Bags. 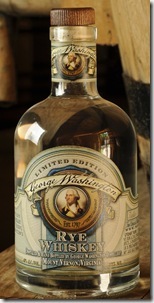 made to George’s own recipe at his own (reconstructed) still–but sad to say barely 500 half-bottles are available and you’d have to go to Mount Vernon to get one. There’s a chance or at least a hope that more will be made in coming years. Shame to leave a still unused, no? What then, to drink? The cocktail king Dale DeGroff, seconding my notion that rum, an early American favorite, should be involved, sent me to Esquire magazine’s Dave Wondrich. A mixological sage, sachem and sagamore of wit and style, Dave proposed a Colonial concoction in which French and American ingredients go together like Lafayette and the Continental Army: Fish House Punch. Finally, there’s the vexed question of what quality rum and cognac to use. Certainly you’ll do very well for rum with Cruzan Estate, although you might want to try Bacardi 8, Pusser’s Navy Dark (especially you Patrick O’Brian fans), Barbancourt 8 or Gosling’s Black Seal. Nor need anything but the economy stay your hand if Mount Gay Extra Old, Pyrat XO or Pampero Aniversario takes your fancy. In cognacs you can swing from the Big Four (Rémy Martin, Martell, Courvois-ier and Hennessy) to the obscure glories of Delamain, Dor, Kelt, Marcel Ragnaud, and Pierre Ferrand. Of course, bunging the best into punches and cocktails will cost plenty without really making a big difference to the final pour, but if being free-handed makes you feel liberal and kingly, go right ahead. It’s your money as well as your style. Many top-shelf distillers would go bankrupt if all their customers did was sip like country parsons. Besides, using any five-star stuff in a punch gives the snob crowd apoplexy. Never a bad thing, actually, and sometimes fun. As for Lafayette, he figured importantly (note the rare correct use of importantly) in 1781 in the Battle of Yorktown, helping to trap and besiege the British army there, which led to the surrender of Lord Cornwallis. In 1824 Lafayette embarked on a triumphant farewell tour of all 24 American states and was elected to membership in the Schuylkill Fishing Company of Pennsylvania in 1825. Thus do we come full circle. And now, mes amis, on to France. For Bastille Day, or any other, for that matter, I propose the cocktail of choice be the French 75, a classic that takes it name from a famous World War I artillery piece. 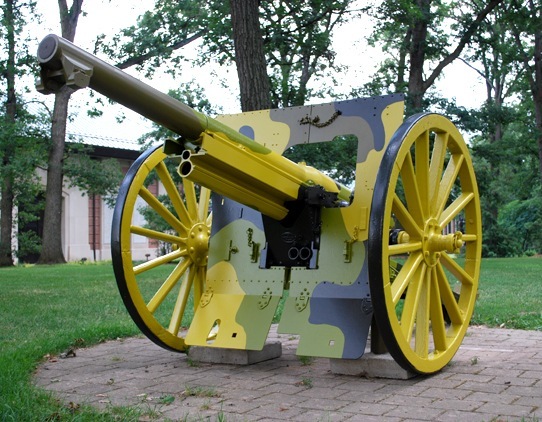 That 75 was admired as a battleworthy piece (what civilians would call a cannon) by both French troops and the American doughboys who went ‘Over There.’ (The 75 refers to its bore diameter in millimeters; 75 mm or just under three inches). A French 75 in war paint. Photo courtesy of the First Division (‘The Big Red 1’) Museum at Cantigny, Ill. The French army of 1914 was both overdressed and undergunned. The poilus made a stirring sight in their blue tunics and red pantalons, but certainement they were also highly visible targets. Worse, they were saddled with the Chauchat, a contraption widely hailed as the worst machine gun ever built: Seemingly always en crise, it was as dangerous to friend as to foe. Not an asset in what turned out to be a machine-gun war. Far better was the French 75 field gun. It was powerful, durable and more or less immovable: an advanced recoil mechanism kept it from bouncing wildly about when fired. Thus it didn’t have to be laboriously re-aimed (‘re-laid’ is the term of art) each time, and so had the (then) amazing ability to fire both rapidly and accurately. How it gave its name to a cocktail is murky; Speakeasy, a book of ‘classic cocktails re-imagined’ by the diligent folks at a Manhattan bar called Employees Only, says some folks believe the drink was created by Raoul Lufbery, a Franco-American World War I hero. Bit of a stretch, that: Lufbery had no truck with artillery. He was a fighter pilot with the legendary Lafayette Escadrille. He scored 17 kills flying Nieuport biplanes, challenging mounts that combined a fast rate of climb with balletic agility and a ‘disconcerting tendency to disintegrate in flight’. He kept a lion cub named Whiskey and allegedly stiffened his Champagne with gin. So. At the very least it’s a fine story, and cocktail scholars agree that the original drink did contain gin, brandy creeping in only later. Harry Craddock’s The Savoy Cocktail Book says to put two measures of gin, one of lemon juice (in 1930, the year of publication, it was unnecessary to specify fresh) and a spoonful of powdered sugar into a tall glass of cracked ice, then fill with champagne. His recipe carries the warning ‘hits with remarkable precision’. British powdered sugar may be different from the American version, which is also called confectioners sugar and which doesn’t dissolve readily in cold drinks. Use superfine sugar (a.k.a. ultrafine or bar sugar) instead. If you’re going the modern way, perhaps you’ll substitute the gin (Tanqueray, Citadelle, Bombay, or—to salute Lufbery—Portland’s Aviation) with cognac. Probably not brandy unless it’s something special, like Ukiah’s Germain-Robin. There’s elbow room here for the creative mixer. Some recipes nix the old 2-1 gin-juice ratio in favor of 50-50, others say 4 gins to 1 juice As for the bubbly, the quantity depends on the glass used, the capacious Collins or the skinny flute. It’s up to you. (Colin Field, ruler of the Paris Ritz’s Hemingway Bar, will allow an ice-filled tumbler as an alternative.). Of garnishes, Saint Harry says naught, so do as you will if you will. Lemon peels, orange wheels and twists, lemon wedges, cherries—all sorts of things turn up in all sorts of recipes. I’d leave well enough alone, frankly. Do you want to drink or do you want to eat? So there you are. Aux armes, citoyens! Or in this case, aux coudes (elbows). Technorati Tags: Cruzan Estate,Bacardi,Pusser’s,Barbancourt,Mount Gay,Pyrat,Gosling’s,rye,Dale DeGroff,George Washington,Esquire magazine,Dave Wondrich,Lafayette,Fish House Punch,Schuylkill Fishing Company of Pennsylvania,Lufbery,French 75,Harry Craddock,Savoy Cocktail Book,Tanqueray,Citadelle,Bombay,Aviation,Germain- Robin,Colin Field,Paris Ritz,Pampero,Rémy Martin,Martell,Courvoisier,Hennessy,Delamain,Dor,Kelt,Marcel Ragnaud,Pierre Ferrand.